Fashion Architect: You go girl! As I was sitting on my desk, cursing because I do have new pictures to post, but can't upload them to post them (aaaarghh), an e-mail arrived. It was from Revolve Clothing, the on-line boutique I'm so fond of, because they stock Chie Mihara shoes and they don't charge shipping for orders over $100. It's where I got my second pair of Chies from, my first ever internet purchase. Anyway, I open the e-mail, and what do I see? 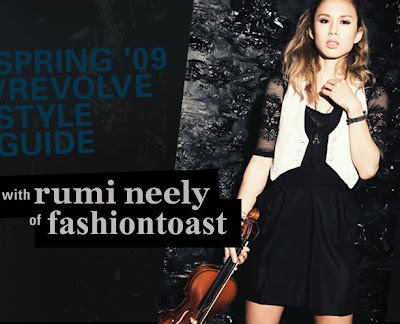 "If you're as addicted to fashion blogs as we are, then you know Rumi Neely of FashionToast.com. With her expert eye in high-low dressing and street-style photography, the San Diego-based blogger has become a go-to source for outfit inspiration. Neely's blog has become a daily read for fashionophiles all over the world — including Esteban Cortazar of Emanuel Ungaro. Not only did Cortazar invite Neely to sit front row during his Fall '09 fashion show, he even scheduled her in for a personal fitting. "When I got the email saying he was a fan, I was floored!" says Neely. Fashion Toast has also opened other doors for Neely, like a highly coveted modeling campaign for RVCA. For our spring style guide, Neeley picked out, styled, and modeled 12 looks that play on her casual, effortless chic. She layers bodysuits, adds crop tops, and shows us how to pair little black booties with almost everything. In addition to her amazing styling abilities, we also found out she is an outstanding violinist — she's been playing all her life! By a fellow blogger? You bet we are! Her style is more on the 80's revival side of fashion, so it may not be everyone's cup of tea, but you've got to give it to the girl, she photographs damn good! Click here to see all the looks she models and be sure to check the behind the scenes video! So happy to see successful bloggers like Rumi receive the acknowledgment they deserve! Erin Wasson (my love!) of RVCA,showed interest herself for Rumi-she even invited her at her NY apartment!..i'm following her for a long time, at first thought that she was showing herself too much but as time goes by she has succeeded in establishing a "rumi style" that is veeeeeryyyy difficult to be accomplished!For that i admire her and i'm happy to see her in the ad!! do we know how old she is? I have her on my updates, I admire her style, I cant even get how she's taking such pics she must have recruited a private photographer or else she is just a miracle-kid.....but I am more into Gala!!! Rumi rocked the hell out of that Style Guide. It's a great feat to rise from the ranks of blogger like that. Congrats to her. Hari K: I've been "stalking" her for almost a year now! I love how she follows her heart when it comes to clothes and doesn't give a dime what others think. She's an inspiration! Clemmie: I don't recall how old she is exactly, but I have the impression she is close to 23. K@terina B: Her very talented boyfriend Colin photographs all the pictures for her blog. She's a lucky gal, what can I say! Δεν ήξερα το revolve clothing και μόλις μου έδωσες έναν ακόμα λόγο να ξοδεύω ώρες στο laptop! actually she is 26 years old!! and her boyfriend Colin is a hottie as well!!! they make a cute couple together! !